If you’ve been doing a lot of spring cleaning – or plan to do so, it’s easy to find a new home for all your stuff that’s still in good shape! The City will be having Giveaway weekend on May 11th and 12th again. You can put items out at the curb with a big FREE sign so that there’s no confusion. 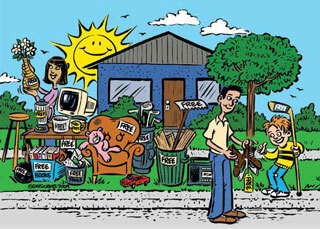 Make sure that the items are still good, clean and don’t break any of the city’s rules. On Sunday night, make sure to put away whatever wasn’t taken. If you’re out looking for free stuff, make sure to be respectful and only take items with a sign on them. It’s a great time to find all kinds of neat stuff – last year we found a reel mower and with a few minutes of sharpening it worked perfectly! Found a lot of yard decor too – and lots of leftover reno items for projects too. You really don’t know what you’ll find! What have been your best finds?